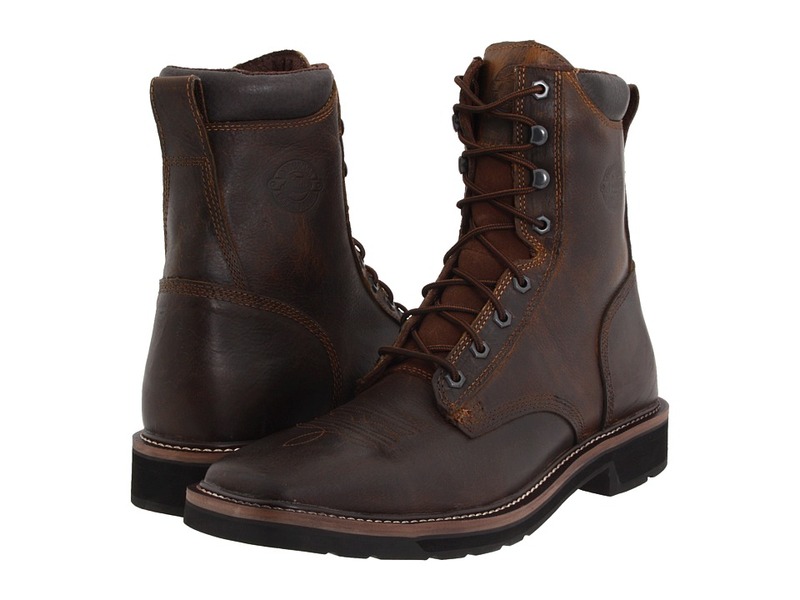 Seek out adventure on the open road while wearing the rugged Harley-Davidson Scout riding boot. Part of the Harley-Davidson Riding Collection that is Built for the Road. Full-grain leather upper with strap and metal O-ring detail. Metal logo plate on shaft. YKK locking inside zip closure offers a secure fit. Soft textile lining for a more comfortable feel. Fully cushioned footbed provides long-lasting comfort. Goodyear welt construction. Durable rubber outsole for traction and grip. Measurements: Heel Height: 1 in Weight: 1 lb 13 oz Circumference: 13 in Shaft: 8 in Product measurements were taken using size 10.5, width D - Medium. Please note that measurements may vary by size. Weight of footwear is based on a single item, not a pair. Jump the fence and make a run for the fresh air of the great outdoors with these dependable Justin boots. Rugged tan upper. Lace-up closure provides a secure and snug fit. Metal eyelets with metal speed hooks for durability. 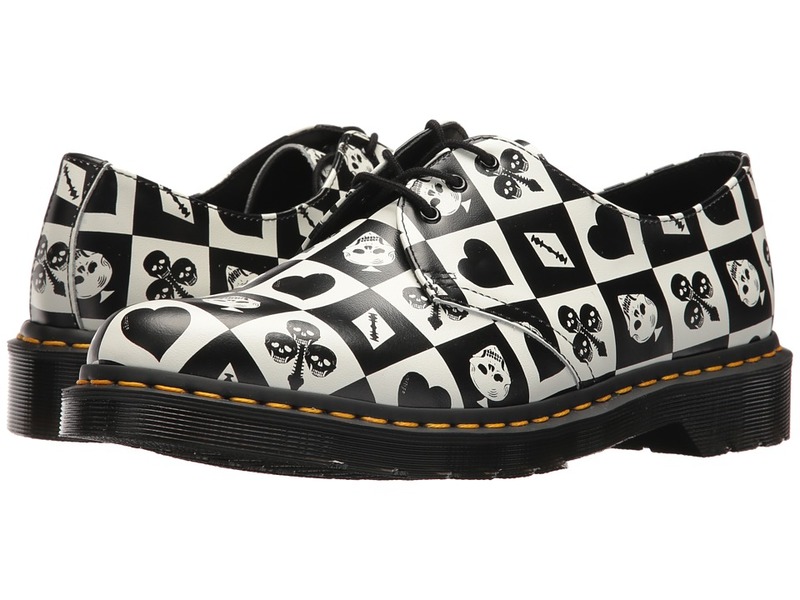 Padded collar with a heel pull for easy entry and comfortable fit. Comfortable cushioned insole. J-Flex flexible Comfort System. Durable Stampede rubber and EVA outsole. Measurements: Heel Height: 1 1 2 in Weight: 2 lbs 2 oz Circumference: 12 1 2 in Shaft: 8 in Platform Height: 3 4 in Product measurements were taken using size 11.5, width D - Medium. Please note that measurements may vary by size. Weight of footwear is based on a single item, not a pair. 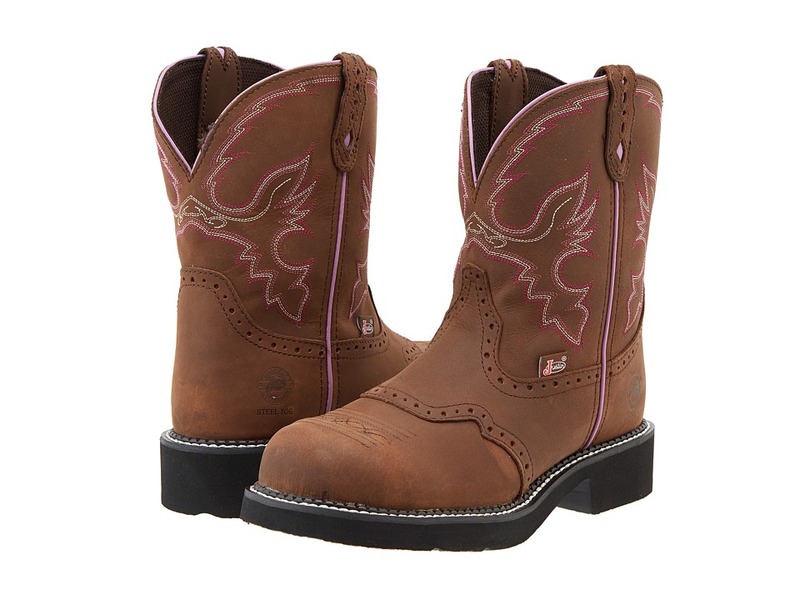 Get ready to wrangle up some western style with these Justin boots. Leather upper with diamond cut details on the pull straps. Leather vamp with perforated details on the saddle. Steel toe for additional protection. J-Flex Flexible Comfort System features a removable insole to accommodate orthotics. Long-lasting black rubber outsole. Exceeds ASTM F2413-05, I75, C75 standards for Electrical Hazard Protection. Measurements: Heel Height: 1 1 2 in Weight: 1 lb 6 oz Circumference: 13 in Shaft: 8 in Product measurements were taken using size 6.5, width B - Medium. Please note that measurements may vary by size. Weight of footwear is based on a single item, not a pair. 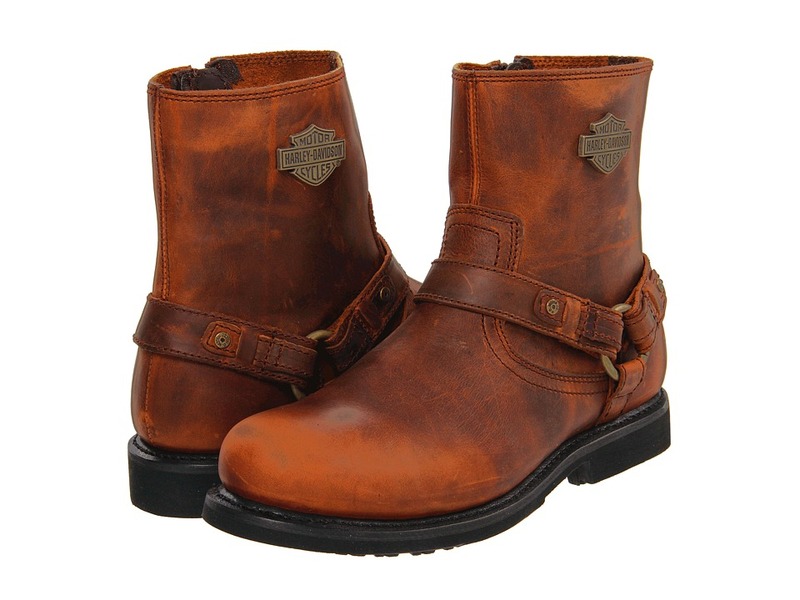 Head off into your weekend ride with the tough yet stylish design of the Khari boot by Harley-Davidson. 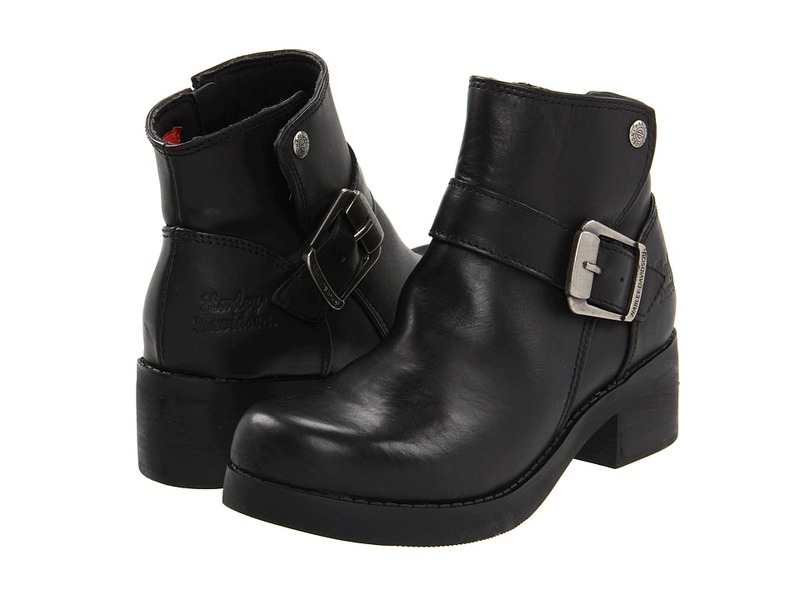 Full-grain leather upper with side-buckle decor. YKK side zipper for easy on and off. Smooth synthetic lining. 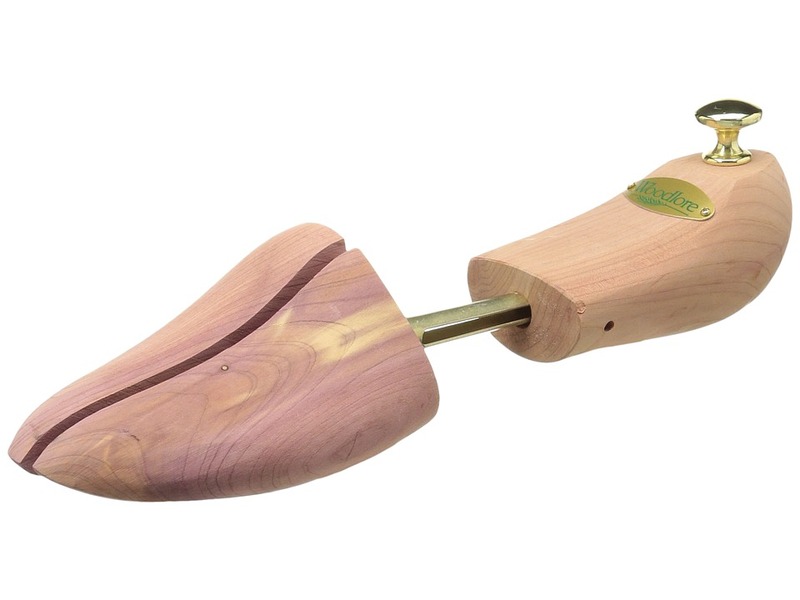 Full-length, cushioned footbed. Durable rubber outsole. Measurements: Heel Height: 1 7 8 in Weight: 1 lb 4 oz Circumference: 11 in Shaft: 5 1 4 in Product measurements were taken using size 7.5, width B - Medium. Please note that measurements may vary by size. Weight of footwear is based on a single item, not a pair.